I felt surprisingly clear-headed in the morning. The slowness and absent-mindedness that usually is my morning companion was gone, hence the morning routines went exceptionally swiftly. Perhaps the possibility to have a meal in few miles was luring me. And there I went once again into a warm morning enjoying the strong scent of the coniferous trees and the golden slices of light falling to the forest floor. I was sweating instantly and the temperature rose close to 30°C (86°F) during the day. After a three mile stroll I came to a paved road and thus out of the 100-Mile Wilderness. 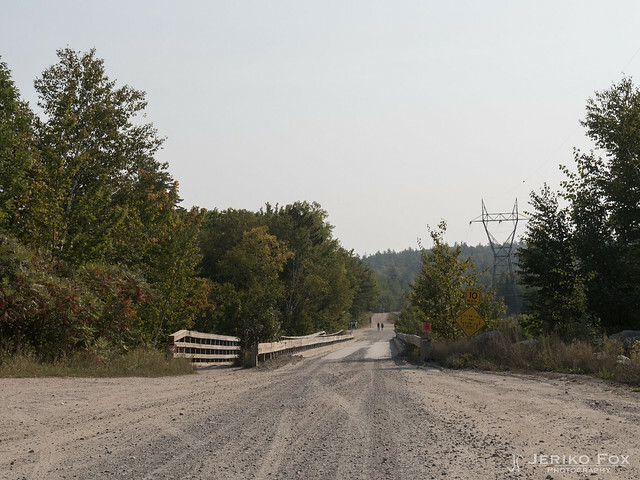 I followed the road and the AT to the Abol Bridge that crosses the Penobscot River. 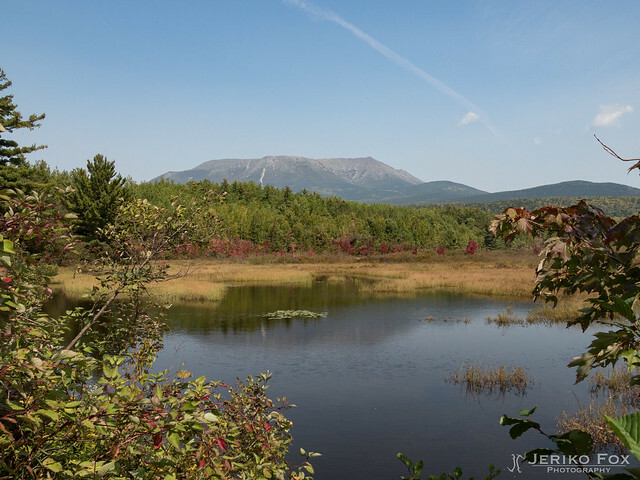 From the bridge there is a beautiful view to the Mount Katahdin. As I was admiring said view, Toro caught me and we headed together with few other hikers to the camp store in the other end of the bridge. 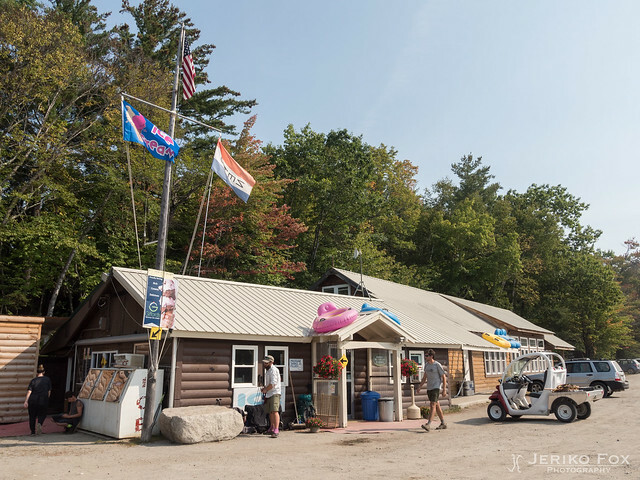 The Abol Bridge Campstore was already open, but the restaurant was about to open in a half an hour. While we were waiting I went to the store to get a Danish bun (to be honest, I don’t know it there is anything Danish there, but the name) and a cold Pepsi. Because life is uncertain and hence the dessert should be eaten first, I also took two scoops of ice cream. Under the scorching sun my Maine Black Bear and Cookie Dough combination was a heavenly treat. And the scoops were truly hiker size. When the restaurant finally opened its doors, we headed there for a lunch that didn’t turn out to be quite what I expected. I ordered a salad with grilled salmon and got a salmon hamburger. I mentioned it to the waitress, but said that I’m way too hungry to wait any longer. I’m not that much into hamburgers in general and this one was pretty dull experience, too. As I was leaving I paid Toro’s bill to thank him for all the help in past few days. The sun was scorching the road and I was relieved when the AT curved back to the shades of forest. 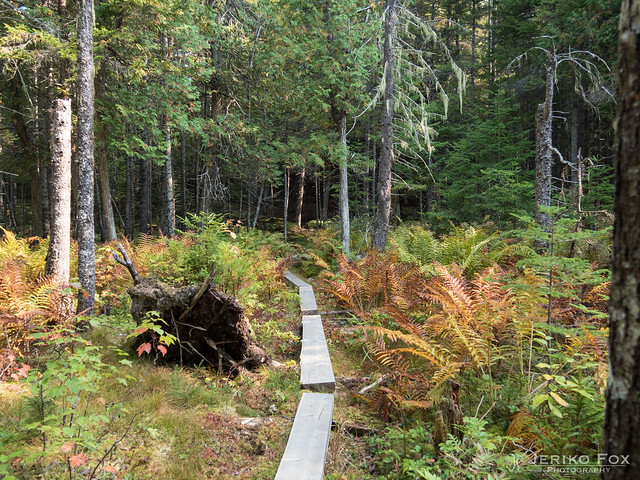 I was arriving to the border of the Baxter State Park. Since the morning I have had stress over the fact where I was going to spend the night. 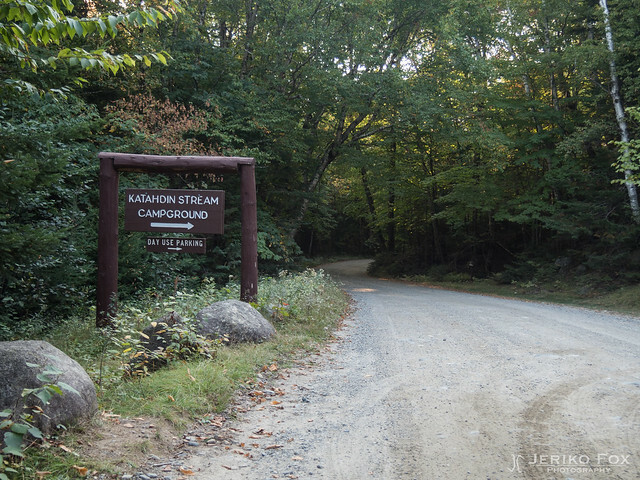 Right at the foot of the Mount Katahdin there is the Katahdin Stream Campground with the thru-hiker lean-to and campsite called The Birches. 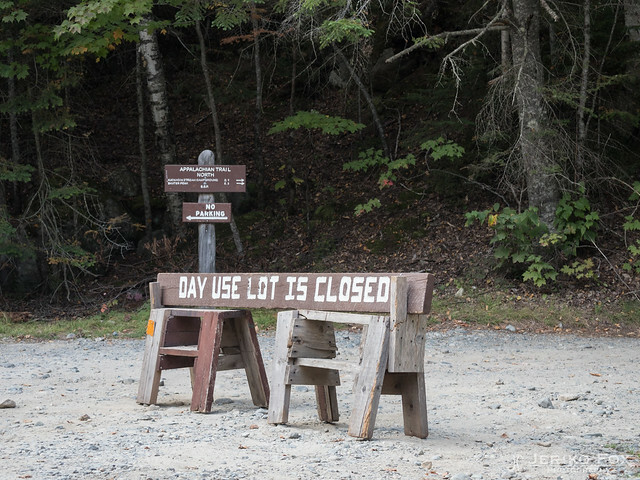 I had pre-registered to The Birches in Monson, but that was no guarantee for a spot. The actual registration had to be done at the information kiosk in the Baxter State Park on the same day when one wants to stay there. 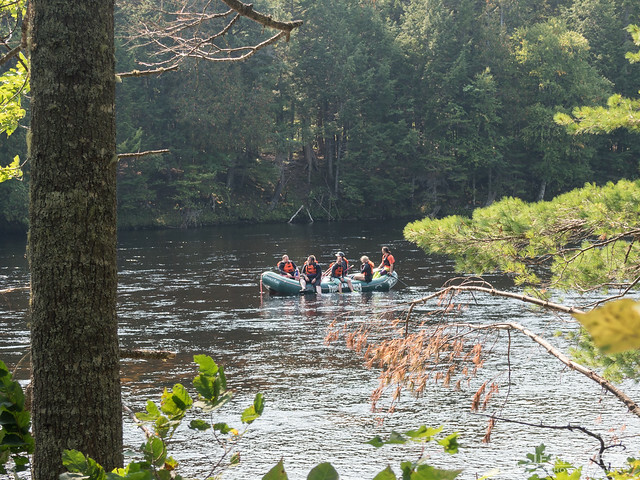 If there were no spots available, the alternative tent site was one of the official campgrounds (the Abol Bridge Campground, Abol Pines or Katahdin Stream Campground) or then one could take a ride to Millinocket and return in the morning. In practical terms the campgrounds are usually booked full way in advance, so getting a tent site there meant really asking nicely some car campers or backpackers if they wanted to share their site. I had met a ranger in the restaurant and he informed me that he saw eight names on the list for The Birches a short while ago. 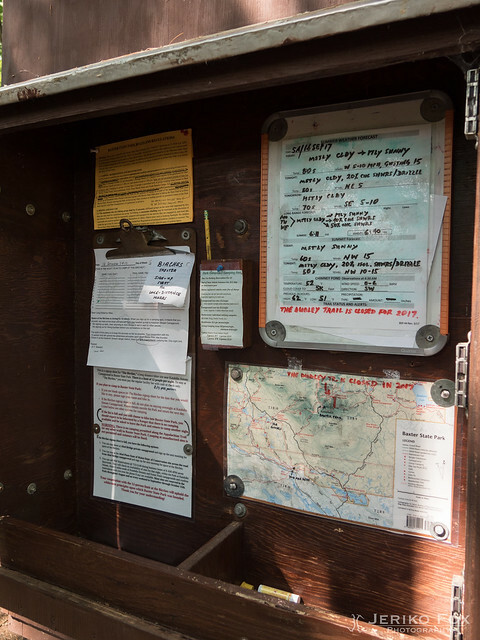 When I arrived to the information kiosk I opened the hatch to see the registration form. There were nine names on the list and contently I scribbled mine below them. The Birches is the best place to stay location-wise, thinking about the summit day tomorrow. At the information kiosk there was also a good map of the hiking trails traversing Katahdin, a weather forecast and much additional info for the hikers. 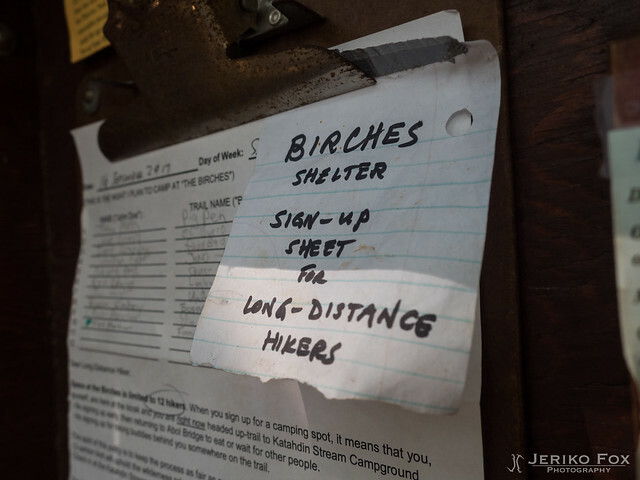 For the thru-hikers there are also the instructions what to do, if The Birches is full. The terrain was very flat and I was moving on pretty fast. I felt more relaxed now that I had nothing to stress about anymore. There were lots of day hikers on the trail and I was amused how I (with my big backpack) swept pass the people who were only carrying a bottle of water. Although we shared the same trail, we were from completely different worlds. 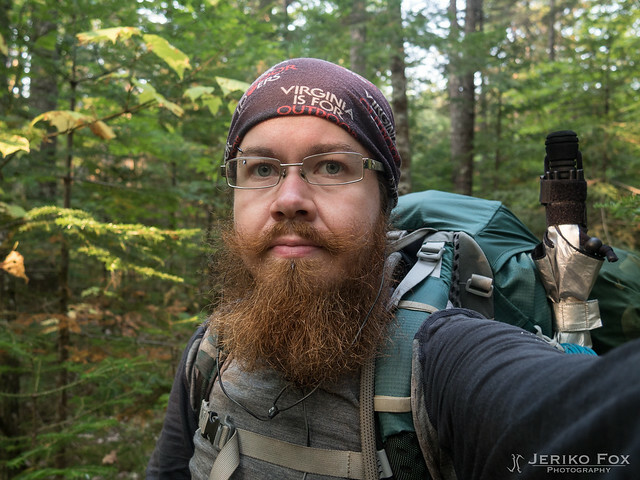 All the nice smelling people with their beautiful clothes and me with my thru-hiker beard and the same shirt that I was wearing the day I summited the Springer Mountain in Georgia. My speed decreased later in the afternoon and in the hot weather I started to think about swimming in the river that was flowing next to the AT. Still I didn’t feel like I wanted to stop hiking, now that I had such a good thing going. 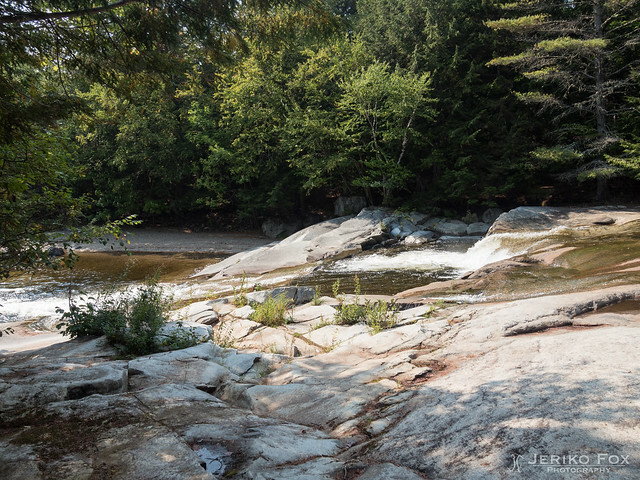 I decided to take off my backpack anyway, kneel on the rock and to dip my head in to the river. 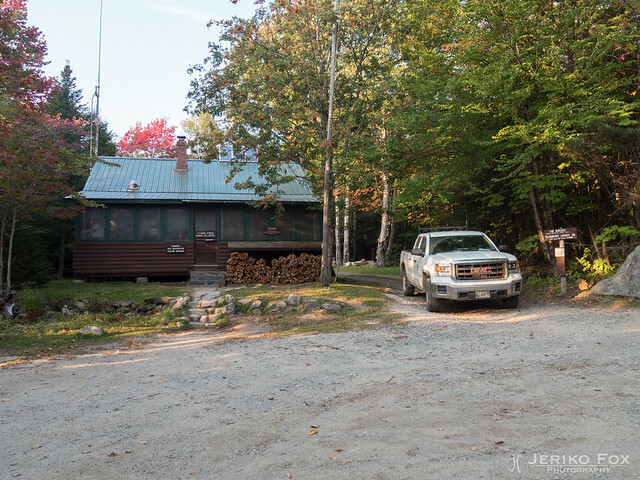 The evening was setting in as I arrived to the Katahdin Stream Campground. According the instructions at the information kiosk, I headed to the Ranger Station to check-in. 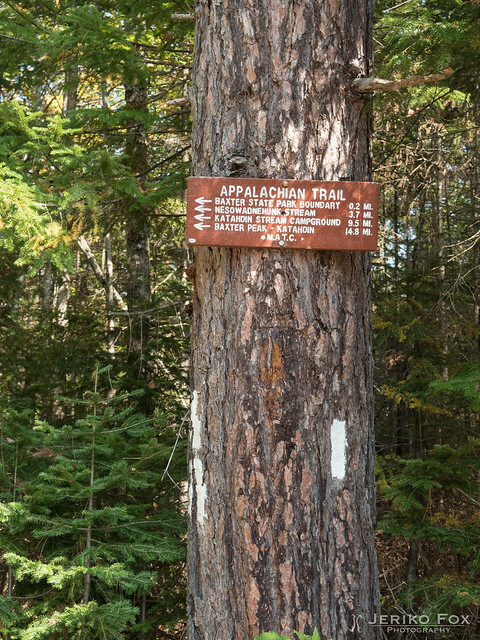 I paid $10 of my stay at The Birches and at the same time got my permit to climb the Mount Katahdin tomorrow. 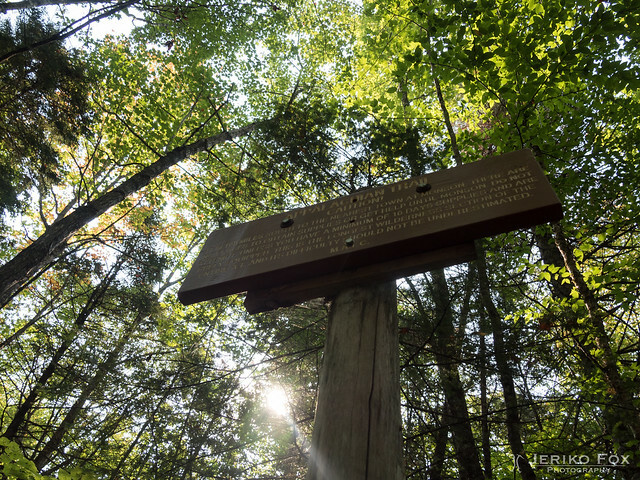 In 2015 ultrarunner Scott Jurek broke the record of fastest thru-hike of the AT (now an old record). 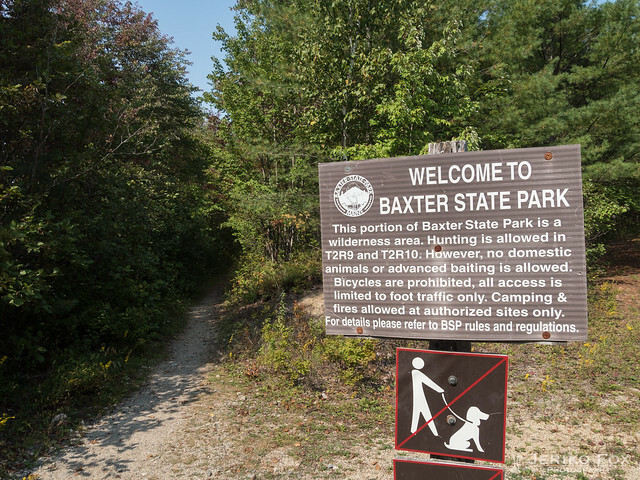 His victory celebrations on the summit got the Baxter State Park people really pissed off, which almost ended up having the northern terminus of the AT moved somewhere else. 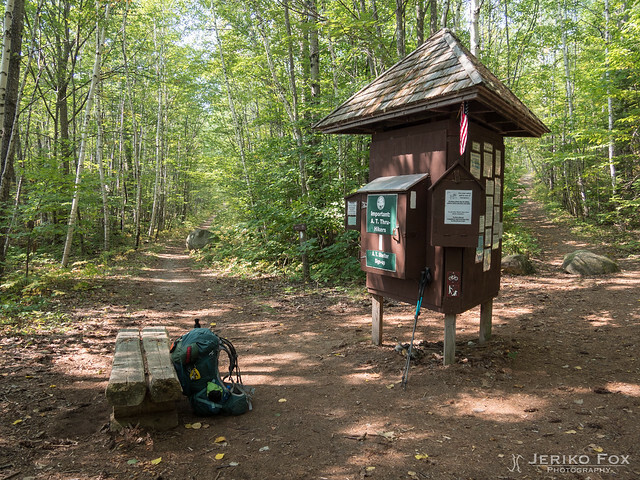 Naturally the AT thru-hiker community was not exactly thankful of this, but luckily the Baxter State Park decided only to arrange a permit policy to summit Katahdin. The permit includes a paper slip that one has to return when leaving and a plastic card that one can keep. When I arrived to Harper’s Ferry in West Virginia I was the 637th NOBO this year. Now at the foot of the Mount Katahdin my number was 853. 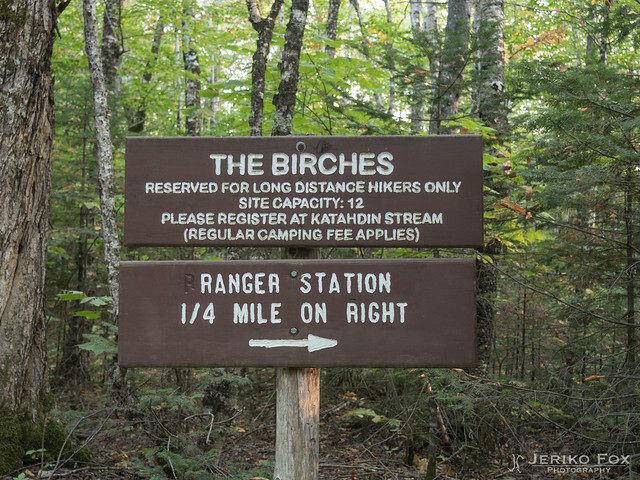 From the Katahdin Stream Campground there is few hundred meters (about 1/4 mile) to The Birches. All the thru-hikers had chosen their tents over the lean-to, but luckily I was able to find me a tent spot, too. It was quite a while when I had last time used the bear cables, but I was happy that I didn’t need to throw my own bear line. 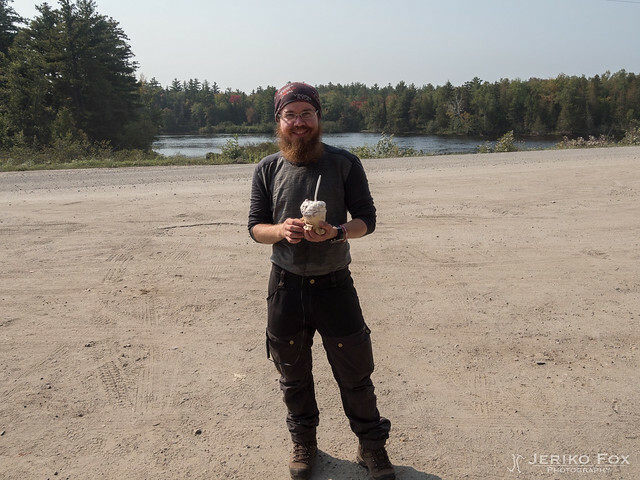 I realised that these were really the last ones: The last time I needed to pull my bear bag up, put up my tent and crawl into my sleeping bag with a book. Tomorrow I would achieve something that I had been dreaming of for such a long time and something that I had been working for really hard. And then I could just go home. Tunsin itseni yllättävän selkeäksi aamulla. Usein vaivaava hitaus ja ajatusten harhailu oli poissa, joten aamutoimet sujuivat poikkeuksellisen nopeasti. Ehkä mielessä houkutteli myös ruokailumahdollisuus muutaman mailin päässä. Niin lähdin taas yhteen lämpimään aamuun nauttien havupuiden voimakkaasta tuoksusta ja metsään lankeavista kullankeltaisista valon siivuista. Hiki tuli heti ja päivän lämpötila taisikin nousta lähelle 30°C. Kolmen mailin tallustamisen jälkeen tulin asfaltoidulle tielle ja siten ulos 100-Mile Wildernessistä. Seurasin tietä ja AT:a Penobscot Riverin yli kulkevalle Abol Bridgelle, josta avautui kaunis näkymä Mount Katahdinille. Sitä ihaillessani Toro saavutti minut ja suuntasimme yhdessä hänen sekä muutaman muun paikalla olleen vaeltajan kanssa sillan toisella puolella olevalle kaupalle. Abol Bridge Campgroundin kauppa oli jo auki, mutta ravintolapuoli avautui vasta puolen tunnin päästä. Odotellessa hain kaupasta Danish-pullan (rehellisyyden nimessä en tiedä onko siinä mitään muuta tanskalaista kuin nimi) ja kylmän Pepsin. Koska elämä on epävarmaa ja siksi jälkiruoka kannattaa syödä ensin, otin myös kaksi palloa jäätelöä. Kuumassa auringonpaisteessa Maine Black Bear ja Cookie Dough -yhdistelmäni oli taivaallinen nautinto. Ja jäätelöpallot olivat todella “hiker size”, vaeltajakokoluokkaa. Ravintolan avauduttua suuntasimme sinne lounaalle, joka ei osaltani kyllä toteutunut ihan niin kuin piti. Tilasin salaatin grillatulla lohella ja eteeni tuotiin lohihampurilainen. Mainitsin asiasta tarjoilijalle, mutta totesin lopulta olevani liian nälkäinen odottamaan uutta annosta. En ole hampurilaisten suuri ystävä muutenkaan ja tämäkin osoittautui yksitoikkoisen makuiseksi toteutukseksi. Lähtiessäni maksoin oman laskuni lisäksi Toron ruuat kiitokseksi häneltä lähipäivinä saamastani avusta. Aurinko porotti tielle täysin esteettä, joten olin helpottunut, kun AT kaartoi takaisin metsään. Olin tulossa Baxter State Parkin rajalle. Aamusta asti minulla oli pieni stressi siitä missä viettäisin seuraavan yön. Aivan Mount Katahdinin juurella on Katahdin Stream Campground, jossa on läpivaeltajille varattu laavu ja teltta-alue The Birches. Olin ennakkorekisteröitynyt Monsonissa Birchesille, mutta se ei taannut minulle vielä yöpaikkaa. Varsinainen rekisteröityminen tuli tehdä informaatioständillä Baxter State Parkissa samana päivänä, kun aikoisi yöpyä Birchesissä. 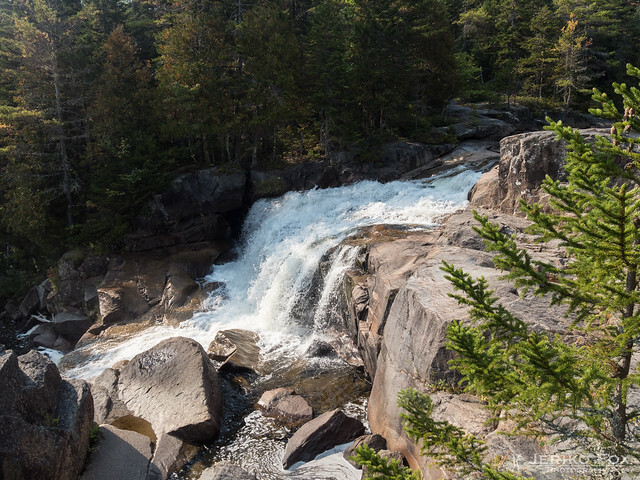 Jos tilaa ei olisi, vaihtoehtona on yrittää saada telttapaikka joltain alueen leirintäalueilta (Abol Bridge Campground, Abol Pines tai Katahdin Stream Campground) tai matkustaa yöksi Millinocketiin ja palata aamulla. Käytännössä leirintäalueet ovat pitkään ennakkoon täyteenvarattuja, joten telttapaikan sieltä voi saada lähinnä pyytämällä kauniisti joltain retkeilijöiltä saako tulla jakamaan heidän tilansa. Olin tavannut ravintolassa metsänvartijan, joka oli kertonut Birchesille rekisteröityneitä olleen hetki sitten kahdeksan. Saapuessani infoständille avasin luukun, jonka takana rekisteröintilappu oli. Nimiä listassa oli nyt yhdeksän, joten tyytyväisenä raapustin oman puumerkkini alimmaiseksi. Birches on sijaintinsa puolesta paras paikka huomista huiputuspäivää ajatellen. Infoständillä oli myös hyvä kartta Katahdinin vaellusreiteistä, sääennuste ja paljon muitakin tiedotteita vaeltajille. Läpivaeltajille löytyy ohjeet miten menetellä, jos Birches on täynnä. Maasto oli hyvin tasaista ja etenin varsin nopeasti. Tunsin oloni helpottuneeksi, koska nyt ei olisi enää mitää stressattavaa. Polulla liikkui paljon päivävaeltajia ja minua toisinaan huvitti, kun pyyhälsin kaikkine rinkkoineni ohi ihmisistä, jotka kantoivat pelkkää vesipulloa. Vaikka jaoimme saman polun, olimme täysin eri maailmoista. Hyvälle tuoksuvat ihmiset kauniissa ulkoiluvaatteisaan ja minä puolen vuoden partani kanssa ja samassa paidassa, joka oli ollut päälläni kun nousin Springer Mountainille Georgiassa. Vauhtini hidastui myöhemmin iltapäivästä ja kuumassa ilmassa mietin uimista AT:n vieressä kulkevassa joessa. En kuitenkaan halunnut keskeyttää vaeltamista, kun hyvä vire oli päällä. Päädyinkin vain riisumaan reppuni, polvistumaan kiven päälle ja työntämään pääni jokeen. 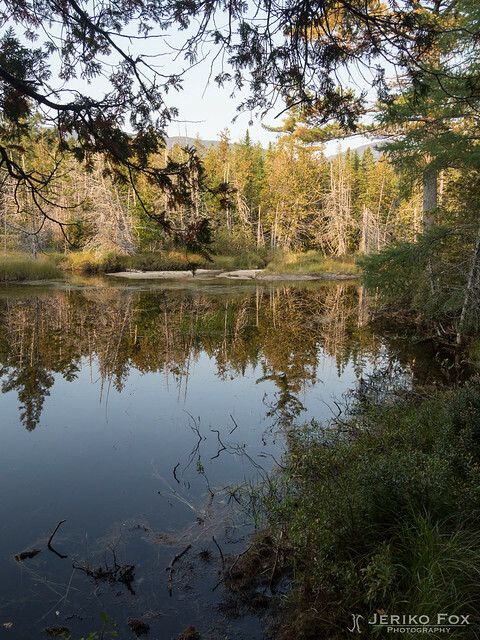 Ilta alkoi olla tuloillaan, kun saavuin Katahdin Stream Campgroundille. Infoständillä olleiden ohjeiden mukaisesti menin Ranger Stationille, metsänvartijoiden majalle, ilmoittautumaan. Maksoin $10 yöpymisestä The Birchesillä ja sain samalla hoidettua huomista varten luvan Mount Katahdinille nousua varten. Vuonna 2015 ultrajuoksija Scott Jurek teki (nyttemmin jo rikotun) nopeusennätyksen AT:n läpivaelluksessa. Hänen voitonjuhlansa Katahdinin huipulla sai Baxter State Parkin porukat pillastumaan, minkä seurauksena oli vaarana, että koko AT:n pohjoinen päätepiste jouduttaisiin siirtämään muualle. Tästä ei tietenkään läpivaeltajayhteisö ole ollut kovin kiitollinen, mutta onneksi Baxter State Park sitten päätyi vain perustamaan lupajärjestelmän Katahdinin huiputtajille. Lupaan liittyy paperilappu, joka pitää palauttaa tultuaan alas vuorelta ja muovikortti, joka jää itselle. Saapuessani Harper’s Ferryyn Länsi-Virginiassa olin tämän vuoden 637. NOBO. Nyt Mount Katahdinin juurella numeroni oli 853. Katahdin Stream Campgroundilta on muutaman sadan metrin matka Birchesille. Kaikki paikalla olevat läpivaeltajat olivat valinneet yöpyä teltassa laavujen sijaan, mutta onnekseni löysin vielä itselleni telttapaikan. Pitkästä aikaa käytössä oli myös karhukaapelit, joten minun ei tarvinnut enää virittää ruokasäkin köyttä itse puuhun. Tajusin, että nämä kaikki olivat nyt todellakin viimeisiä kertoja. Viimeistä kertaa kiskoin ruokani yläilmoihin, pystytin telttani ja kömmin makuupussiini kirjan kanssa. Huomenna minä saavuttaisin jotain mistä olin jo kauan unelmoinut, minkä eteen olin tehnyt määrätietoisesti töitä, ja sen jälkeen voisin palata kotiin.